India Art n Design inditerrain: Origami with molecules? A building with collapsible walls and roofs, an arm with smooth, seamless joints like a green branch instead of mechanical pairs, a micro-sized drug delivery system digging into a specific gland or a ‘paste’ that forms into a defined shape may well become a reality quite soon! Progress in the materials sciences sees attempts to ‘design’ molecular patterns and thus micro-sized forms. However, there are limitations that hold up scaling this up to visible objects of our daily use. I am referring to the Buckliball-inspired experiment at Harvard and MIT. with Postdoctoral Fellow Jongmin Shim. Photograph by Eliza Grinnell, Harvard SEAS. 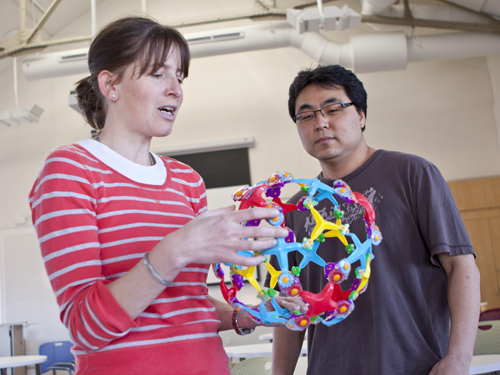 A team of scientists at MIT and Harvard led by Katia Bertoldi, Assistant Professor in Applied Mechanics at Harvard; and Pedro Reis, the Esther and Harold E. Edgerton, Assistant Professors of Civil and Environmental Engineering and Mechanical Engineering at MIT wrote about this work now published in Proceedings of the National Academy of Sciences. 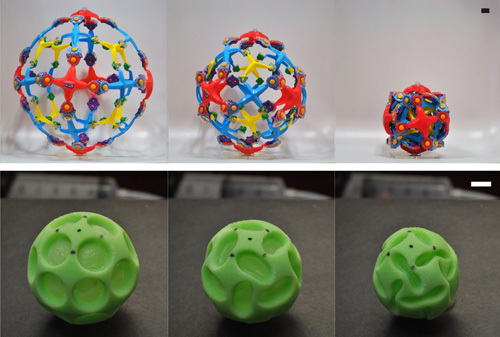 Inspired by the Buckliball, a toy ball made of complex hinged joints that folded this ball into becoming a smaller one, the team ‘constructed’ a soft rubber ball. Inter-molecular air sucked out of it, saw the ball form dimples and churn itself akin to the Buckliball into a smaller shrivelled ball, in an orderly way. pressure-induced buckling behavior (bottom row). Photograph courtesy: Katia Bertoldi. In origami, it has been possible to turn and collapse cubes and polygonal prisms by valley-folding their faces diagonally and twisting them into becoming compact paper springs. This experiment now makes for such “Buckligami” behaviour. It will be possible to build structures of molecules or compounds, albeit presently in soft materials, that will collapse in an orderly way under pressure and then build back to their original form when such pressure reverses. Practical applications could extend to include robotic skins and fibres, collapsible roofs and walls, controlled bending of beams or paste morphing back to an original shape on being released from a vacuumed dispenser as well as specialised drug delivery systems. 1. Denise Brehm, Civil and Environmental Engineering Dept, Massachusetts Institute of Technology, USA. 2. Caroline Perry, Harvard School of Engineering and Applied Science, Harvard University, USA. I think there are designs for modern space satellites that are based on the principles of origami which allows them to collapse for transport in to space. Posted by Adam Mottershead on Linkedin Group: London Architecture Network in response to IAnD's discussion thread:How far can design explore the practical applications of origami? Can you think of some inspired applications or would you have any suggestions? It is possible. I think the opportunities in building construction will be more towards the internal fixtures and fittings (eg. foldaway beds, tables etc.) rather then the entire structure. It might be solution in small modular housing, especially in high risk natural disaster areas, where a foldaway sytem will be ideal in minimising infrastructure damage. Posted by Anup Magan on Linkedin Group: London Architecture Network in response to IAnD's discussion thread:How far can design explore the practical applications of origami? Can you think of some inspired applications or would you have any suggestions? 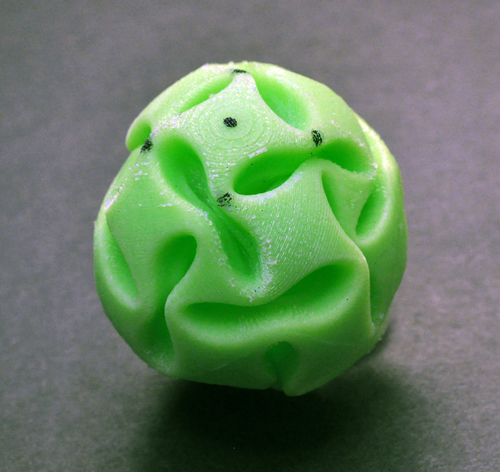 Perhaps the various applications of textiles could achieve foldable and moveable results. One could not only look at origami but at sails and sailing boats where big sails are constantly reeved, folded, unfolded and oriented towards the wind. The beauty is that they combine very old knowledge with the newest materials. Posted by Catja de Haas on Linkedin Group: London Architecture Network in response to IAnD's discussion thread:How far can design explore the practical applications of origami? Can you think of some inspired applications or would you have any suggestions? There are several examples of practical applications of origami, from full buildings to lamps. Posted by John Newbold on Linkedin Group: Design & Architecture in response to IAnD's discussion thread:How far can design explore the practical applications of origami? Can you think of some inspired applications or would you have any suggestions? Moroso Italian furniture company has experimented with origami flower forms in a series called Antibodi.Great materials and well exetuted designs as always. Posted by Afroditi Tsoukala on Linkedin Group: Design & Architecture in response to IAnD's discussion thread:How far can design explore the practical applications of origami? Can you think of some inspired applications or would you have any suggestions?